Kevin had watched the bodies of his parents laid to rest. Because of his unexpressed grief, he knew the neighbors in the small farm community labeled him as unfeeling, especially after he had fled the gathering at the farmhouse after the funeral to escape their awkward expressions of sympathy. The walk in the woods he knew so well relieved him of the building pressure, for well away from discovery he threw himself down on a soft hummock of grass and gave vent to his anguish. Comforted, he returned to the house and bade farewell to the remaining close neighbors, waving away all offers to accompany them. Once the house was empty, he walked from room to room feeling the presence of his parents, the love which flowed, it seemed, from the very walls surrounding him. The simple wills were a mere formality. The attorney looked at the set countenance before him, perplexed by the lack of emotion the boy exhibited throughout the ordeal. "What do you plan to do?" Kevin shrugged. "Keep on with school, for one thing." "Very practical, but can you farm the place and maintain your work?" "I don't plan to farm." "You know how little money there is?" Kevin fixed the lawyer with a cold glance. "Just settle things. I can take care of myself." He said and left the office. He apologized to his employer for his lateness and pushed the lawnmower faster to make up for lost time. The hedge would need attention in a couple of days and there was the rose garden to spray. All his time could be taken by this one garden were it not for the frantic demands of two others, so he parceled out his efforts, keeping meticulous time cards for each job. He had scarcely entered the house when a tap at the backdoor broke into his thoughts. He walked slowly toward the door and swung it open. "I brought you this here pot of stew, Kevin. I thought you might fancy somethin' you didn't have to cook yourself. You're welcome to come over any time. John and me would be pleased to have you put your feet under our table." The wife of his closest neighbor held out a heavy pot. Kevin nodded. "I'll put it in one of our pots and you can take yours home." Grudgingly, he pushed the door open and let her follow him into the kitchen. He transferred the stew and washed the pot. "You didn't have to do that," she said as he dried the pot. "No trouble." He handed her the pot and all but pushed her out the backdoor. "Thanks." "I swear," she remarked to her husband when she got back home, "that boy gets stranger and stranger. He couldn't seem to wait to get me out of the house." "He weren't impolite, was he?" "No, but he wasn't exactly happy 'bout my being there neither. He sure don't take after Jim nor Martha, neither. I never seen a body as cold as him at the funeral. Makes a body wonder." "You know the boy's always been a bit queer 'bout folks. Never was company like the rest of his people. Best you leave him be from now on." "I hate to think of him all alone there without nothin' to eat but what he scraps together for hisself. You know how kids is nowadays." "You offered to have him here and he didn't come. Now you've took over there. Iffen he’s hungry, it's his own fault. I don't guess he looked like he was starvin'?" "No. I didn't get to look in the icebox, but I guess he eats somethin'. The place is spotless like always. You'd think Martha was still cleanin' every day." "Guess somethin' of his maw rubbed off on 'im. Now you quit frettin' 'bout him, he ain't none of your worry." Kevin lifted the lid of the pot and sniffed. The stew smelled good and he needed something warm against the chill of the evening. He switched on the burner under the pot and went back to his studies. He'd taken only five days and the weekend, but the amount of work to be made up seemed endless. A few days later, one of the secretaries of the college stopped him as he left class. "Here's a number you're to call. They said it was urgent." Kevin dropped the slip of paper into his pocket. After his last class he walked the twelve blocks to the lawyer's office. The secretary looked casually at the jeans clad youth as he came through the door. "Yes?" "Mr. Anson wanted to see me." She looked closer, thinking rapidly. "Oh, yes, you're Kevin Clark. Mr. Anson is with a client just now. If you care to wait ..." She waved a hand toward one of the chairs. Kevin dropped into one in the far corner of the room, aware of the secretary's gaze. She took in the worn jeans, cheap cotton shirt covering the lean hard body, the long brown hair, but it was the boy's piercing cold green eyes that fascinated her. She believed that one's character could be read through the eyes and the frigid sharpness of his direct gaze made her shiver. She answered the buzz of the phone and looked at Kevin. "You may go in." He looked at the lawyer. "No, thanks. What is it?" "I've had a very generous offer for your farm. Knowing your financial situation, I'd advise you to take it. It's a good ten thousand over the evaluation." "Don't take too long. I'm not sure how long the offer will remain open. But I take it, then, that I can tell the party that you will consider it?" "Good." The attorney arose and moved to Kevin's side. "Is there anything you need?" Kevin glanced at him nervously. "No. Is that all?" "Yes, unless you decide to accept the offer." "Okay." Kevin slipped quickly out of the offices. Back in the familiarity of the house, he leaned back in one of the kitchen chairs. "What should I do?" He asked softly. "I've got an offer for the place. If I take it, it means that I can finish school and have a little something, maybe, to get started with. It's not your fault there's so little money. We lived good and there was enough for school. But you didn't want me to be a farmer, dad. You always said the place was too small to make more than a bare living." Peace flooded over him and with it, the words: We love you, son, your mother and me. I'm sorry I couldn't leave you more to finish school on, but you've only got one more year. Do what you have to, but finish your education for your sake, and then you can live free of anybody but yourself. Let's take a walk, son. Kevin walked slowly across the field to a stretch of woods, waiting for the words to come again. He stumbled. He caught his balance and looked down at the abandoned rusting rail line. The house is just a place, son. Wherever you go, your maw and me'll be there. If you had someplace to live, it might not be a bad idea to let the farm go. Like you say, it's all your maw and me could give you. 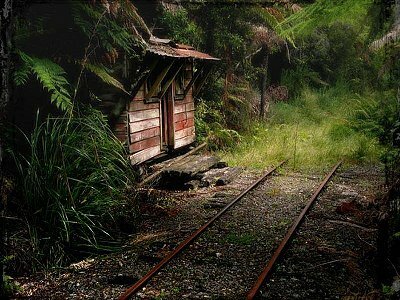 Kevin sat on a tuft of grass, looking at the old rail line and shack. You know, onc't I had the idea of fixin' me a place in the woods here, but then I met your maw. What I had in mind was gettin' an old freight car from the railroad and havin' it put here. That's why I never bothered to sell these old rails fer scrap. They was put here years ago when there was a mill to the other side of the creek. When the mill burned, the railroad took out the switch and left most of the tracks. I guess it was a crazy idea, but it used to seem right good. You could sell the house, it don't make no difference, but your maw and me want you to have a roof over your head what's your own. Sell the farm and keep this patch o’ woods here and maybe build somethin' to suit yourself someday. As Kevin left the woods, he looked across the fields to a passing freight train. The next afternoon after classes, he turned toward the lawyer's office. "What can I do for you, Kevin?" "What does the railroad do with cars when they get old?" "I said, what does the railroad do with cars when they get too old to run anymore?" "I kind of thought about getting one." "What on earth would you want an old train car for?" "I thought I might sell the farm like you want me to if I could get an old caboose to live in." "You can't live in a caboose! That's insane! Where would you put it?" "There's this piece of woods on the farm. I'd sell all the rest but that and put the caboose there." The lawyer shook his head. "I think you should take the offer for the farm, and we could exempt the woods from the sale, but don't you think the idea of living in a caboose is a little far fetched?" "No. Can you help me or not?" "I suppose so. I can find out from the railroad's agent about the caboose." Kevin opened the seldom used front door of the house, looking first at the man who stood there, then beyond to the station wagon parked in the lane; the side of the vehicle's door emblazoned with the logo of the railroad. "I'm John Andrews, the local agent. I got a note from the main office to see what you wanted." "It's simple. I want one of your old cabooses to live in." "I could get you one, but it wouldn't be fit to live in. When we retire them, they're pretty well done for." "Don't make no difference. I could fix it up, long as it's cheap." "I think we could come to terms on price. You'd have to have a place to put it and you'd have to pay moving charges if we haul it." "No problem. I've got the place and there's rails right up to your mainline. If you could put a switch in to get it off on the spur, I could get it to where I want it." Andrews frowned. "Let's see what you have in mind." Once the agent called in from the mobile unit in the station wagon, they walked across the field to the tracks. "I'll be damned," the agent said after examining the spot, "this spur doesn't show on the map I've got. Must be a real old one." "It was put in for the old mill. Must be thirty years or more." The agent bent to examine the old rail line. "No way we could put a locomotive on this. Ties are gone; the rails would spread." "Would they hold a caboose?" "Might, if you moved it real slow." "What about getting it here?" "Track gang could throw in a temporary switch. Once we get it clear of the mainline, it's your worry. Going to cost you time and labor for the switch." "Long as it doesn't come to too much. You get it on these rails, I'll move it from here." The agent shrugged. "If it's what you want." Another note from the attorney a couple of weeks later brought Kevin back to the uncomfortable surroundings. "Might as well sit down, Kevin, this is going to take some time." He perched on the edge of a chair by the desk. "First of all, I've got a certified check for the farm. The party was willing to pay what I suggested and they're willing to give you three months from the date of sale to clear the property. Second, the railroad has a caboose they'll let you have for six hundred dollars plus transportation and labor to get it off on your siding. I guess it's what you want, it's the biggest type they have." Within the week. I guess it will all come to about twelve hundred." "Tell them to do it." "It doesn't seem practical to me, but I don't guess I can talk you out of it. Sign these forms and this check and the agent will contact you when to be at the siding." Kevin cut classes on the agreed upon date and spent the morning cutting the bushes and saplings that had grown between the rails near the mainline, conscious of the curious glances of the track gang. Finally, he heard the horn of the diesel switch-engine and watched as it pushed the caboose slowly down the track. Once the caboose was on the siding, the engineer climbed down from his cab. "What you going to do with this old thing?" "Going to rebuild it and live in it." Kevin looked at the faded, flaking paint, the rust pitted metal work, the glassless windows, with a sinking feeling. "Sure hope you know what you're doing. Wouldn't mind having one myself, but I'd want it in better shape that this one. Well, good luck." Kevin waited until the track gang had taken out the switch and gone before walking back toward the barn, glancing at the sky. There might be time. If he left the caboose out here in plain view, it would draw questions from the neighbors. He drove the small tractor back and linked it to the caboose with a length of heavy chain, hoping that by driving slowly, the chain would hold, the caboose stay on the rails. Almost imperceptibly he eased ahead, feeling the drag lessen as the wheels began to turn. Twice he stopped to cut pine saplings with the chainsaw, then moved ahead. When he reached the place where the idea had been given, darkness shrouded the woods, silent save for sleepy twitterings of birds. The darkness had come too deep for him to do more than unhitch the tractor and return home. Early the next morning, he climbed the steps of the caboose. The door stood ajar, glass missing from the frame. He pushed it further open and looked inside. It was stripped of everything of value except a couple of brass oil lamps dangling from the ceiling, brass shades lying on the floor, and a small pot-bellied stove collapsed in one corner. It would take time and work to make anything of it, time he could ill afford from study and his jobs. He picked up the texts he had left on the steps and walked an ill-defined path through the woods to the highway to thumb a ride. Every spare minute for the next few days he studied and planned, drawing a list of materials needed to recondition the caboose. The only difficulty lay in getting the materials to the farm. The old pickup was beyond repair after the accident and had been towed away. John helped Kevin unload the materials into the barn. "What you goin' to do with all this?" "Few things need fixing up. Thought I might as well get what I needed and then I'd have it when I get time to work." His neighbor shook his head doubtfully. "Place looks pretty good." "Yeah. But you know how things run down fast if they aren't taken care of." "I suppose. Let me know iffen I can he’p you any." "Sure. Thanks for the use of your truck." Kevin breathed a sigh of relief once the truck rattled off down the lane. The worst part of having to ask for help was the questions. He could work without help now." For the next few weeks every opportunity was taken in the renovations. Broken boards were torn out and replaced, interior bulkheads removed and repositioned. Slowly, the car took shape as he had envisioned it, three-quarters of the space had become one room. The single remaining bunk-bed was left in place for seating and sleeping. The smaller area divided to serve as a bath and a kitchen. Bone weary, he pressed the lid on the paint can firmly and stepped back. The caboose looked as though it had never heard the clack of wheel against rail. From the red paint to the black trim, the polished brass fittings, it was complete. It remained only for him to move the few things he wanted from the house to be self-sufficient. In spite of his weariness, a grin of pride flashed across his face. For a fleeting moment he heard his father's voice: You done a fine job, son. I'm proud of you. Kevin threw himself into study; three weeks remained before the end of term with a term-paper due. The clack of his typewriter broke the stillness into the early hours. The paper must be good to compensate for the work he'd let slide. He paused to stroke the cat lying on the chair near his desk and turned back to type the finishing lines. His head drooped lower and lower until it came to rest on the text. As the kerosene lamp flickered and went out, he undressed in the familiar darkness and flopped down on the bunk. The professor sat at his desk, glowering at the final report sheet, unable to make up his mind. A grade appeared by each name, save one. If he closed his eyes, he could see the student clearly - just a bit over six feet, so skinny that he looked taller, long dark hair and a moustache, a face expressionless but for the intense green eyes which spoke disappointment each time he had been handed a paper with a consistently low grade. Now, this. The professor raised from his slouched position and picked up the term-paper once more. He'd been over it three times, unbelieving, yet it was perfect. Beyond the technical perfection, it was as fine an expression of the subject as he'd ever received from a student. Everything pointed away from originality, but as the paper counted in lieu of an exam, he must be satisfied. The office of student services had only a rural address, no phone listing. In desperation, the professor questioned students in his last class. "I see him once in a while thumbing rides in the late afternoon. I picked him up once or twice." One responded. "Where'd you let him off?" "'bout six miles out of town. There's nothing there but woods, but if you want to follow me, I'll show you where." He trailed the student's car closely, responding to the brake lights, and looked to where the student pointed toward a thick growth of pines. He pulled his car onto the shoulder and parked as the student's car roared away. A few hundred feet away, a sturdy rough-sawn plank spanned the wide ditch. Driven now, more by curiosity, he gingerly made his way across the plank, pushed through the undergrowth lining the ditch, and eased between the pines. An ill-defined path of matted pine needles led into the thicket. I've been had, he thought after covering several hundred feet through the trees. He started to turn, disgusted, when a flash of light arrested him. He walked the short distance, stopping in astonishment. 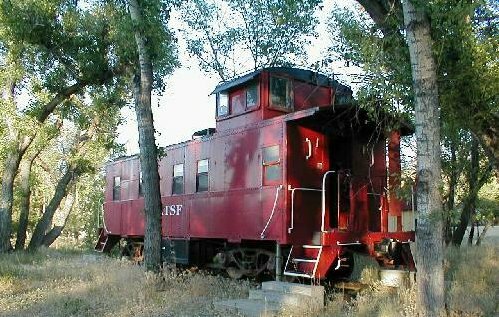 Brilliant in the slanting rays of the sun, a caboose stood on a length of rusting rail. The paint was fresh, the metal work gleaming. He shook his head at the improbability. A large yellow cat lay on the tiny landing before the door, watching him. When he climbed the steps to knock at the door, the cat rubbed languidly against his ankles. At the lack of response, he pressed his face against the glass pane. In the dimness of the interior he could make out only the bunk, neatly made with a colorful patchwork quilt and several pillows strewn on top. Feeling slightly guilty, he stepped back, jumping at the soft sibilance of the pine needles behind him. Kevin stood there, impaling him with intense eyes. He shivered under the gaze. "Oh, hi. I needed to see you." His discomfort increased as the boy said nothing but bent to pick up the cat and resume his gaze. "About your term-paper, Kevin ..." ‘You really are making it hard,’ he thought. "How could you turn in an absolutely perfect paper when your class work has been marginal?" "Are you asking if I cheated?" From past experience he should have anticipated such directness, yet he blushed slightly, averting his eyes. "I ... I guess that's about it." "Would you believe me if I said no, then?" Kevin pushed past him on the tiny platform, pulled a chain from around his neck, and inserted the heavy old-fashioned key in the lock. He entered, motioning for his teacher to follow by a jerk of his head. The professor looked about curiously. Across from the quilt covered bunk, a small upholstered chair. A desk was built into the bay window, before it a bent-wood chair. Shelves to one side of the desk held a small collection of books. Opposite the desk, the small potbellied stove was freshly blackened. Original railroad oil lamps of brass gleamed in the last rays of sunlight filtering through the trees. Kevin lifted the chimney of the lamp over the desk and lit the wick with a match. The glow warmed the shadows, revealing the cozy aspect of the caboose. Kevin pointed to the books. "You gave us a free choice of subjects, so I wrote about what I really like. I worked hard on that paper because I knew I needed the grade to pass. You may check if you want, but I listed every one of those books in the bibliography, along with those the library got for me." He picked up the cat and carried it into the tiny kitchen and opened a cupboard. His teacher thumbed through one of the books and replaced it. "Why didn't you do as well on the tests? You have the ability." Kevin looked up from the bowl he was filling with cat food. "I have to work. Spring is a busy time for a gardener." "I guess that does it, then. You will pass the course." Kevin nodded. "How did you find me?" "I asked one of the students you ride with. Is this where you study?" "This is where I live," Kevin answered shortly and crossed to the door, opening it, standing, waiting. At the apparent dismissal, his teacher left, walking carefully in the dusk, all the time wondering, his curiosity unsatisfied. Except for his innate respect for things, Kevin would have slammed the door. He felt naked, stripped of his privacy, angry at the implication against his integrity. He thrust his way outside and dropped to the grass. Kevin, son, you ain't lived among people much. I guess it seems most everybody is out for hisself, but most is still honest, I 'spect. It don't take more'n one or two to make a body suspicious, and I 'spect your teacher has had more'n his share of 'em in class. Your daddy and me know you're honest and you know it. That's all that counts. Just do your best and know we love you. Comforted by the sound of his mother's voice in his mind, he went in to eat and study. At the start of fall semester, he gave notice at two of the estates, keeping his work at the third because of kindnesses shown him. By spring semester his mind was made up. He gave notice to his employer and threw himself into his studies. He crossed the stage, received his diploma, and resumed his seat, avoiding looking among the audience. He had sent no invitations, there was no one who cared. He stripped the robe from his shoulders and ran to the highway, thumb already extended. "I did it!" He shouted once he was in the woods. For the first time, the voices came in concert. We're so proud, son. We saw it all. Jim, didn't he look wonderful when he walked across that stage? Martha, dear, he looked like the man we always knew he would be. Oh, Kevin. At his mother's voice, Kevin felt his cheek brushed by a light kiss. It might have been a gentle breeze, but not a leaf stirred. His shoulder felt compressed as it used to when his father squeezed it in affection. A longing returned. Kevin, their voices sounded in his mind once more, we must go now. We have seen you come to be a man. You no longer need us to guide you. We ask only that you be always as good and honest as you are at this moment. "Come back!" Kevin cried in despair. "Don't leave me!" We love you, son… The words faded away. Kevin arose from the grass and looked around. It was only a few acres of woods with a ridiculous old caboose sitting in the middle of it. In the dusk an owl called - Whoo. Kevin started, then grinned. "I don't know yet, but I'll find out." In one corner of an old caboose a spider spins an ever increasing web; field mice burrow into the mattress; and through the window broken by a storm-tossed branch, a house wren carries straw for her nest among the fallen books. Somewhere, a skinny kid with long brown hair and intense green eyes stands on the side of the highway, his thumb outstretched, an adult to be reckoned with.